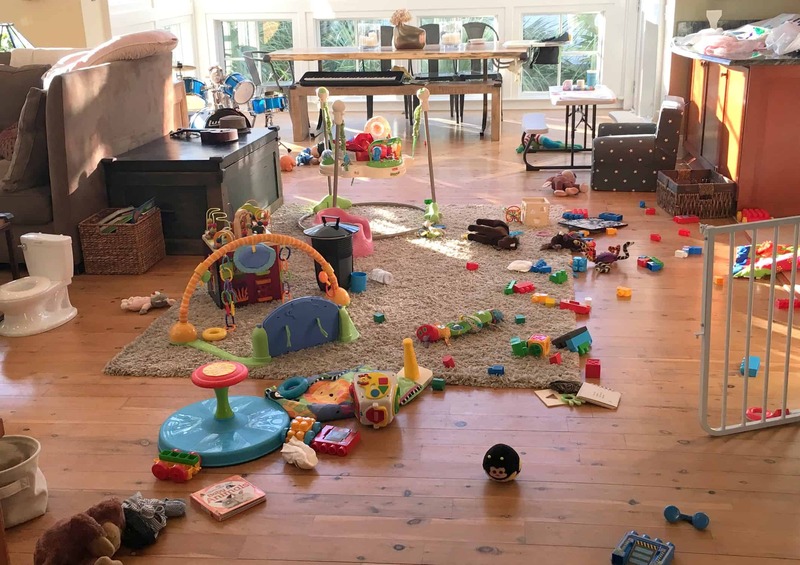 I call this the Toddler Tornado. Or the Baby Blizzard. I’ve been right where you are. Scouring the internet for all the baby gear I will need. Or think I will need. The truth is, when I was pregnant with my first I didn’t know where the heck to even start. So I did what any resourceful person who wants to be informed does: I googled baby gear. I’d say being an avid “researcher” is one of my strengths and weaknesses. A strength because I make really informed decisions. And a weakness because I do not make a decision quickly. 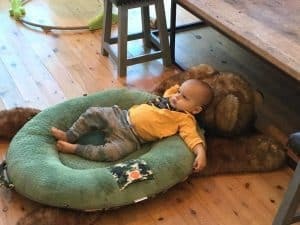 I spent hours upon hours reading up on things and researching the “best baby gear.” It turns out there are about a million “baby gear lists” out there. And I’m about to throw you one more. Because what’s one million and one, amIright? 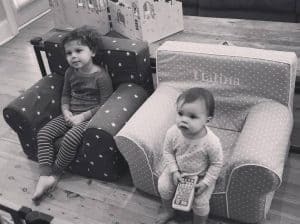 With two children and 4+ years into Motherhood, I can definitely say that my greatest resource on everything related to baby gear & babies & kids & Momming is…other Mamas. My fellow Moms. Why? Because we’re living it all day every day. We know stuff. And we keep it real. So here is me being that fellow Mama to you. Without further adieu, C’MON MAMA’s Baby Gear Must-Haves…that you won’t find on other lists. (Of course, some of it’s on other lists, because there are universal no-brainer baby gear items that I can’t leave off). But a lot of baby gear items on this list are things I never saw on any list but learned about from my fellow Mamas or my own trial & error. I’m going to put this in order of age(ish). Boppy Lounger: Both babies hung out on this every single day for the first 4 months, starting on Day 1. We loved it. You can wash it in a regular washer (insert praise hands emoji here). Anything you can use daily for 4 months straight with a newborn is a W-I-N. See below for another version. Pello: This is similar to the Boppy lounger. It’s basically a more $$$ version but it lasts longer age-wise. We were gifted one for our son and actually got the oval Twin size because it is more oblong than round and he was a beast of a baby so the extra room was great. When they get older they can still fit in this and lounge to drink their bottles, watch shows, etc. 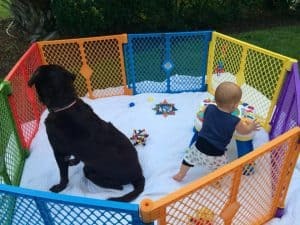 Rock n Play: Yes, it’s amazing & worth every penny. Both my babies slept (& napped!) in it next to our bed until they could turn over. We didn’t have any issues transitioning them to their cribs when the time came, but I know that’s a worry some Mamas have. Don’t waste energy and sleep on what may or may not happen in 3-4 months when you move your baby to the crib. If your baby sleeps in it now, it’s working. *I loved these so much I had 2—one upstairs & one downstairs. We’ve had both the extra cozy one and the regular one. 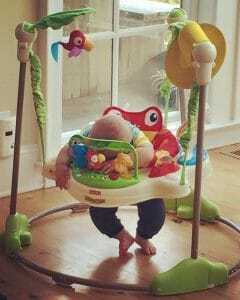 Swing: Some babies love them, some babies hate them. The swing gave both my babies 4 hour naps for months on end so this Mama is Team Swing. Crib: Go ahead and spring for the convertible rails. It will make it a breeze when you need to convert. Plus, you will be wishing you had gotten them from the start when you go to the buy them because you need them & they’re discontinued (this has happened to many Mamas I know). We have this one & have loved it. We converted it to a full bed for my son’s “big boy” bed. Crib Sheets: Man oh man I love these! Zip the top part on & off in 5 seconds! Crib mattresses fit very snugly into the crib so this makes changing the sheets a breeze! Get 1 or 2 extra top sheets & you’re good to go—or get one of these sets with extra top sheets included. I’ve used these for 4+ years. They hold up. Dohm Sound Machine: We have one in every single room in the house now, along with this portable one for travel. Babies really do like white noise. And what babies like, babies get…because that’s ultimately good for Mama & her sleep + sanity. I love the simplicity of the Dohm machines. Baby gear must-have for sure. Baby Monitor: I don’t have a perfect recommendation on this. We have a Motorola video one that has worked great. Not super advanced, but reliable and no lag time, etc. The battery in the handheld goes dead quickly-ish but that’s an easy $10 replacement. I’ve long wanted a WiFi one so we could see our babies & what’s going on when we’re out or away. I’ve had my fave picks in my Amazon cart probably 6 times. I’ve spent hours reading reviews & researching them. But I’m a little freaked out by the whole “are those WiFi waves safe being that directly around my baby all night long” debate. Yes, we have WiFi running through our whole house so those EMF waves are already there. But, they’re not pointing straight at my baby’s precious brain while she sleeps. Or maybe they are. I have no idea. Night Light: This one is adorable, soft & just the right brightness for those nighttime diaper changes. And as they get older they love to play with it. Blackout curtains/shades: Wait for the first Daylight Savings Time to hit and you’ll be sorry (as I was). You’ll love having a consistently dark room for naptime & bedtime…and your baby will, too. When DST hits and it doesn’t get dark until 9:00pm, you’ll be desperately trying to drape towels & blankets over all the windows (spoiler: that doesn’t work). I tried about 17 different blackout options (thank gosh for Bed Bath & Beyond and their easy returns!). I had 2 requirements when picking some: 1) that they actually do blackout the room (weirdly most don’t) and 2) no strings or cords (strangulation hazard). These shades and these curtains are hallelujah-worthy. They look great & are effective. 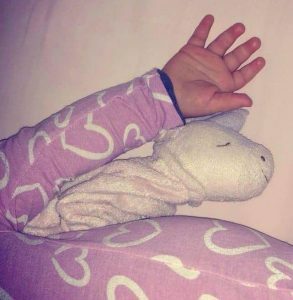 Swaddle: If your baby needs a swaddle, MiracleBlanket worked wonders for us with our son. Our daughter didn’t like to be swaddled. They come into this world with their own little personalities, just you wait and see. Nursing/Breastfeeding Pump: Check with your insurance. With mine, insurance covered it 100%. I believe it was a piece of legislation passed during the Obama era. I’m not sure if it’s still in place or not, but check on it. I got to get a pimp pump: The Medela Pump in Style. I picked the tote one & it lasted me through 2 babies & a combined almost 3 years of pumping. If I could do it over again I’d get the backpack style because I can see how that would be so handy. Oh, and definitely get this pumping bra. My Brest Friend Nursing Pillow: I loved this thing so much, especially with my first. Tried both this one & the Boppy one but the fact that this one buckles around you is a game changer. You can walk around with it on and if baby falls asleep you have arm support. It’s amaze. My hubby even used to wear it to give the babies their bottles when they were little because it helped support their delicate heads…and his big Daddy arms. Bottle & Pump Sterilizing: Get the microwave sterilizer bags. Hallelujah for the the easiness of these things! Drying Rack: Love it, I got 2 of the smaller ones because I didn’t know this larger one existed. These little trees are perfect for drying bottle & pump parts…and later for sippy cup parts. Diaper Rash Cream: Triple Paste FTW! Recommended by our Pediatrician and man oh man does this stuff work wonders! 2nd kind we use is Aquaphor. Aquaphor is awesome for creating a barrier so the poop doesn’t just sit right on that delicate skin. If your baby always poops during the night or nap, Aquaphor before bed is great. Triple paste for when they are red from the poop. Both of these work wonders. My kids actually request “clear” or “white” whenever they feel irritated. (If you ever get a crazy terrible diaper rash going—and this can happen (I had no idea how bad it could really be)—comment below & I’ll send you the big guns we used to get it under control! Strollers: For infants, get a caddy stroller like this universal one or one of these Chicco caddy strollers (if you’re going with a Chicco infant seat): KeyFit Caddy or Shuttle Frame. Trust me on this. A caddy stroller is holy grail baby gear status for me. It’s basically a frame stroller that your infant seat pops in & out of. Talk about easy breezy. Lightweight, fits easily in your car, if baby is asleep you don’t have to wake him or her up to use the stroller; you just snap the infant car seat in & out. Add this stroller organizer to hold your water + coffee + phone, and you’re golden. And when they outgrow their infant seat, there are a million choices. I wore mine a lot (see below) so after they outgrew their infant seat I actually didn’t use a stroller a ton when I was out & about. But, at home I had the BOB and wouldn’t want to do without it. 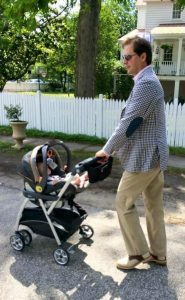 If you live anywhere that you can go on a walk, get the BOB, get the infant seat adapter for your car seat, & enjoy that fresh air. When they’re older get the snack tray. Carriers: I L-O-V-E wearing my babies!!! LOVE. Do it while you can. Because before you’re ready they will be too big and you won’t be able to anymore. For the teeny tiny newborns: this is so easy. Also loved my Solly wrap and once you get the hang of it it’s easy. For when they get a little bigger, loved my Tula. Not going to lie, mainly got it for the design options. You can’t wear your baby facing out with this one. But truth be told I never wanted to do that–I wanted to hold them close to me. They have the rest of their lives to face out and see the world, I wanted to wear them facing me like a hug. *NOTE: My son has been off the charts in height & weight since he was about a month. So he has always outgrown things by size very quickly. When he outgrew the Tula I was crushed but I found this LILLEBaby for toddlers that I’m obsessed with. It’s actually the most comfortable thing ever because it has killer lumbar support (turns out I need that now. But I’m still young & cool, right? Right.). My son is over 4 feet & 50lbs and I wear him super duper comfortably. And he still loves when I do. It goes up to 65 lbs & you can do backpack carry which is fun when they’re a little older. 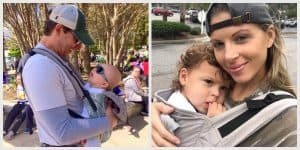 Now that I know how comfy the LILLEBaby is with that awesome lumbar support, if I had to do it again I think I’d get this LilleBaby carrier over my Tula. Because back pain is real, Mama. Backpack Diaper Bag: When I was registering for my first, I asked my Mama if she thought a backpack or regular diaper bag would be better. She said backpack because it would free up my hands and be so easy to throw on. I didn’t listen. (When will I learn?) I quickly realized how much better a backpack diaper bag would be when I was trying to juggle all the things in my arms—including a living being. So I researched (of course). This diaper bag backpack is awesome. I’ve had it almost 4 years now & it’s holding up amazingly. I love to wear it. My husband loves to wear it. It is SO easy. Tons of storage & zipper pockets, plus comfortable to wear. And here are 3 other options that are also awesome. I’m loving this one. This one is also killer and this is a similar but less expensive version of it. NoseFrida: Get it. Looks weird. Sounds weird. Actually is a little weird. But it’s crazy effective. It works. I mean like really, really, really works. Didn’t get it with my first. Thought I didn’t need it. I thought wrong. Loved having it with my second. Nail Clippers: I didn’t use any when my babies were really little. Because their nails are so flimsy and you can easily just bite them off. Yep, I said it. And I did it. It works. BUT, when they’re a little older, you need a good nail clipper. I tried a few ones that were just crap. Sucked it up & paid more for this one and it’s the bomb.com. Some of the cheaper ones don’t cut the nail all the way and it gets kind of stuck and then you pull it trying to get it and it goes too deep and your baby cries and then they’re traumatized and clipping their nails becomes a huge hassle. But this pair works so well, so easily, that you’re done before they even really realize you started. WIN. I use it on my 2 & 4 year old. Infant Bathtub: Looooved this one. Nowhere for mold to grow = added bonus! For when they can sit up, get this adorable duck one! Bonus: the duck tub makes for the cutest photo-ops ever. Double Bonus: they now also have this swan one! And of course, all the baby gear basics like wipes, diapers, burp cloths, washcloths, hooded towels, blankets, etc. Don’t get the fleece-y towels. Yes, they’re so soft but they don’t absorb a thing. Stick with the regular terry cloth/cotton ones. I do love muslin blankets, especially the bamboo muslin ones. Aden & Anais and Little Unicorn are my faves—they both have super soft ones with great designs. They’re breathable (read: safer) and my son still sleeps with these blankets at 4 years old. High Chair: This one. Love it. Would get it a million times over. Funny story—for whatever reason, my mother in law was very eager for me to pick out a high chair so she could get it for us. She had seen her niece’s daughter sit in her high chair and eat cheerios while watching Sesame Street once and that vision just really stuck with her. So when I picked this one she was so disappointed. “But there’s no cushion and it’s not even soft.” I said “I know, that’s exactly why I want it!” No cushions to keep clean, no crevices to try to reach = perfection! We didn’t see it the same way, ha. I got a second one for my daughter because my (giant) son sat in his until he was 3.5. Also, these are SO cute to decorate for birthdays. Just saying. Portable High Chair: The Inglesina fast chair. One of my favorite baby gear items EVER. EVERRRR. Seriously, buy it now. Babies can sit up far before they really fit in the restaurant high chairs. The problem is that while they can sit up in those, they are so low down that it’s too easy for them to bang their mouth or chin on the table. This chair is super portable, super easy, works on almost all tables, & puts the baby up at the right level. We’ve used ours for over 4 years & through two children. We don’t leave the house without it. (Side note: also easy to take with you or keep at Grandmom’s house if they don’t want/need a permanent high chair out.) I’d say this one is a baby gear must. Bibs: My favorite ones ever are some brand called Neat Solutions sold at Target. They’re lightweight, easy to wear, easy to wash, easy to scrunch up and throw in the diaper bag, and cheap. They’re also weirdly impossible to catch in stock & not sold online so if you find them get a bunch. 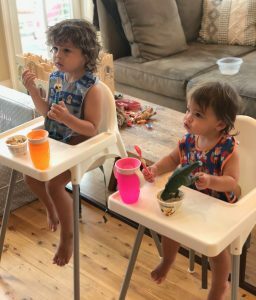 I cannot link them so check them out in the high chair picture. The picnic table in action. Cups: These are the only truly spill proof/leakproof cups I’ve found. All of them claim to be. But they are not. Many of them may not leak with the most gentle use ever, but we’re talking about toddlers. And little kids. Traditionally not the most gentle beings. Their cups drop (or, ahem, are thrown) like 20x a day. Cups that can go through that & not leak are few & far between. Plus they have a bunch of different sizes as they grow. And a stainless version that basically acts like a baby/toddler YETI cup. We love those for days out & the beach, etc. (Also, all these cups fit so well in car seat cupholders & diaper bag side pockets.) My 4 year old still uses these. *For babies/kiddies going to daycare/preschool, these InchBug labels are awesome. I use the adhesive ones & they stay on in the dishwasher (yay!). People love the band ones, too. Place mats: For eating out, these place mats qualify as holy grail baby gear. Forget the silicone ones you have to wash. We’re trying to make less work for you, Mama. (Just recycle some extra stuff and you won’t feel bad about using these.) They’re amaze and keep your baby eating on a clean surface at a restaurant. Because tables are dirtyyy, yall. I used to be a server. I know. Kid Picnic Table: This could be in the food or activity category because this thing is awesome. So easy to clean. Folds up in a breeze (though we leave ours out 24/7). Perfect table for tea parties (or coffee parties if you live in my house), coloring, play-doh, and actual eating. Weatherproof, too, so you can keep it outside. We’ve had it for a couple years and use it every day. It’s not often you find an item with a nearly perfect 5 Star rating on Amazon. Baby Gear: Confinement. Sometimes you just need your kids to be confined. Embrace it. GoPod: Awesome to have for outdoor hanging, beach, vacations, picnics, etc. Or just so you can take a shower. Super portable, keeps them confined which is often times exactly what you need. Pack ‘n Play: One of the famous baby gear items. I debated whether to put this at the very top in the “Newborn Sleep” section or here, because it’s perfect for both. A Pack ‘n Play is essentially a travel crib. I never used it as a crib in my home but many of my Mama friends used it as a second crib for naps, etc. or when baby is in their room (I used a Rock ‘n Play when they slept in my room). We used it as a playpen/place to confine our babies whether it be laying there or playing in there as they got older. And when you travel to a hotel or the Grands’ house, this thing is key (or they can have one of their own at their house in lieu of a crib). BUT, for true sleeping, I recommend adding this mattress & this padded sheet to make it not feel like baby is sleeping on a flat rock. (Hack: put this soft mattress on top of the hard mattress it comes with & then put the padded fitted sheet around the whole thing. Super secure that way. And I wouldn’t do this for newborns, only for older babies (too soft for newbies)). Play Yard/Play Pen: Back in the day, they used to be called playpens. You probably spent some time in one just like I did. This is the most similar to what used to be around; it has a built-in floor/bottom & mesh sides. This is what I have and it works great over our own floor/rug/mat (it comes in multicolor & tan). There are benefits to both types. The former gives you a solid/clean bottom (especially good for outside). The latter gives more space to play (and can get rained on outside). Take your pick, but just know that once baby starts moving, you may will want a safe area to confine her to. So you can bathe. And eat. And pee. Mobility is a game-changer. Little Helper Kitchen Tower/Stool: This thing is so cool. 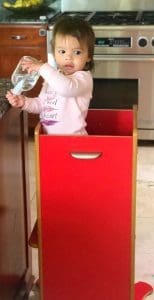 It provides the perfect place to let your baby or toddler stand & be part of the action. They can help cook, eat at the counter with you (if you’re like me & usually eat standing up while unloading & loading the dishwasher), color & paint, drum on the counter, play in the sink, watch you cook, etc. And it keeps them safe & confined the whole time. It has adjustable height, closed sides (why they make similar things with open sides I’ll never understand), & is super easy to clean. I’ve had 2 because I learned the hard way that they are not made to be left outside for months on end (my bad). We used it to paint at the easel on the porch & then I just left it out there because we were painting daily & that was a no go). This Little Helper FunPod is a great way to let your little one be part of the daily stuff with you. Also, my 4 year old 50lb son still loves to get in here to cook. My 2 year daughter loves to snack & hang out in it when I’m in the kitchen. Bike Trailer: This one is wonderful if you plan on having two children at any point. Or even if you don’t (one child can ride it in, too.) It has the biggest weight capacity we could find, which is important when your 4 year old weighs 50 lbs! In other words, you’ll be able to use this for a looong time. We’re obsessed with it. Also, it’s super easy to take on & off your bike. Pottery Barn Anywhere Chair: Worth the hype. They’re adorable, so comfortable, the kids think it’s the coolest thing to have their own chair. And it’s so cute to see them sitting in them & chilling like the precious little villains they are. Get the standard size. The “my first” one is tiny and though I’ve never seen the oversized one in person, my son is enormous for his age and the standard one has been perfect. We got them at around a year old for both kids. There you have it. C’MON MAMA’s Baby Gear Must-Haves. Congrats, Mama. You’ve done all the legwork. Now, enjoy the ride. Mamas, what are some of YOUR fave baby gear must-haves? Tell me below! *You can also shop everything above + all my Amazon Must-Haves & Faves (for Mama Things & Baby Gear & everything in between) in one place on my C’MON MAMA Amazon Page. Yaaaaaaas 🙌, this is what I needed to see! It is so hard to sort through everything and decide. Thank you for making my life easier with this list! You’re so welcome! Lists were life-savers for me when I was trying to figure out what all I needed–it can be so overwhelming! Congrats, Mama!